Mining rare minerals from seabed Jump to media player Nick Davis reports on the new rush to mine rare earth minerals from the seabed. Deep sea mining 'worth £150bn' to UK Jump to media player Deep sea mining could provide the UK economy with a "great deal" of mineral resources and wealth, a marine biologist claims. 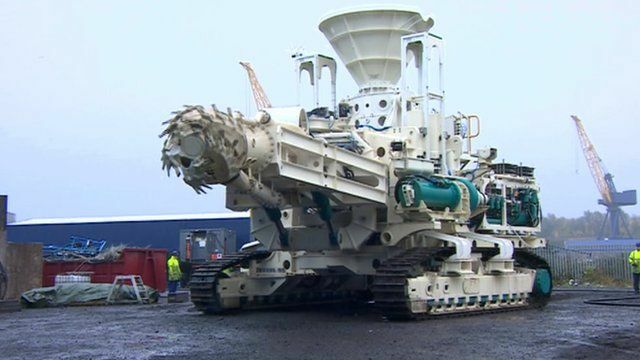 Two of the world's biggest, and most powerful, deep sea mining machines have been unveiled on Tyneside. Soil Machine Dynamics (SMD) Ltd in Wallsend have spent the past five years designing and creating the robotic machines which are designed to work remotely on the sea bed, scouring out precious metals and minerals. Both are now bound for the Pacific Ocean off Papua New Guinea where they are due to begin deep sea work in 2018.